← Hello, it’s not Christmas yet! You may be asking, I know she cooks and bakes and so does her husband, so where is their Thanksgiving menu and recipes? Truth is, we have rarely celebrated Thanksgiving in our own home once since we have been married, including the year I was pregnant with Andy. We were afraid to leave home since he was due right around that date. 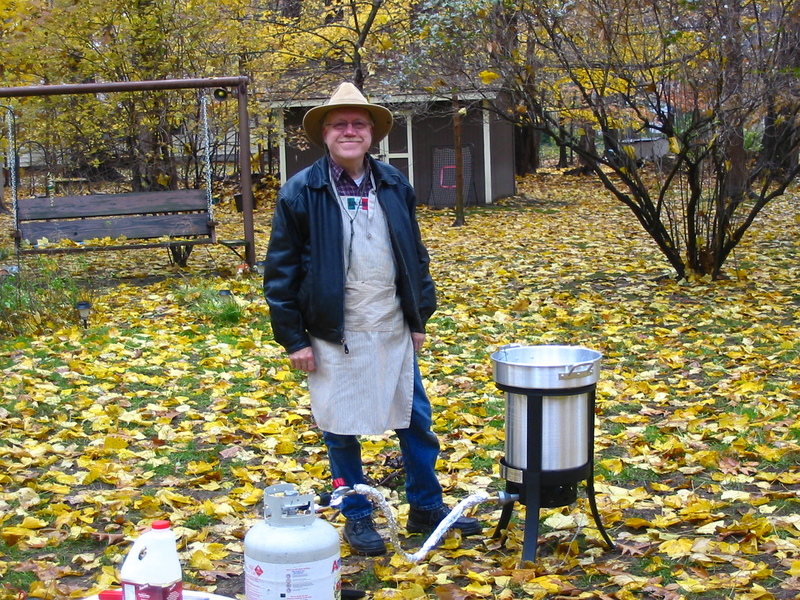 We have cooked turkeys at other times of the year including deep frying, but that story can be found on Dana’s blog. No, we usually go “over the river and thru the woods” to one of our parental homes in Southern Ohio. We don’t even take any food with us, so while I can’t give you a rundown of any delicious dishes we will be baking, I can tell you where to buy something really yummy that will add a sweet beginning to your day. When we lived in Southern Ohio we rarely had real maple syrup. When we moved to Northeastern Ohio we found we lived right next door to Geauga County where some of the finest maple syrup in the world is made. 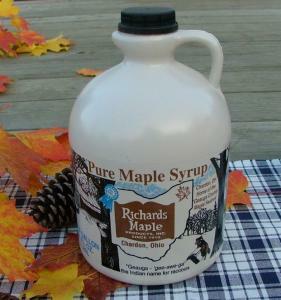 Our explorations led us to Richard’s Maple Syrup in Chardon, Ohio, and we have been loyal customers every since. It takes approximately 45 gallons of the maple sap to make one gallon of high quality maple syrup. Because of the ideal soil and climate conditions, the syrup made from the sugar maples in Geauga County, Ohio is considered to be the very best, and has become famous around the world. If you have ever had real maple syrup you know that the grocery store “syrup” products cannot compare. GRADE A LIGHT AMBER is a light golden syrup, with a delicate flavor and smooth texture. GRADE A DARK AMBER is a robust maple syrup. Of course, as the name implies, it is the darkest of the grades. We have tried all three, all are delicious but we usually buy medium or dark amber for the stronger flavor. Light amber is what is usually served in restaurants and B & B’s. All can be used in cooking. 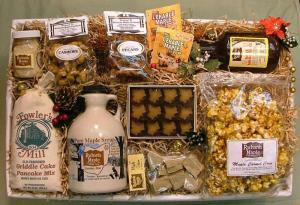 Richard’s carries other maple products such as maple candies, maple butter and maple sugar, along with local jams and jellies and honeys. They ship all over the world, and quickly I might add. We are lucky to live close enough to run down every once in a while and stock up. The only problem with going to their store is there are so many good things on their shelves – they make delicious maple popcorn too, with and without nuts! My mother has a new waffle maker just in time for our Thanksgiving family reunion so we sent her a 1/2 gallon of medium amber as part of our contribution to the feast. On Thanksgiving morning think of us enjoying our homemade waffles with rich, dark Geauga County maple syrup from Richard’s! This entry was posted in Cooking, Family, Food, Holidays, Ohio, Review, Travel and tagged Food, Geauga County, maple syrup, Ohio, Thanksgiving, Travel. Bookmark the permalink.